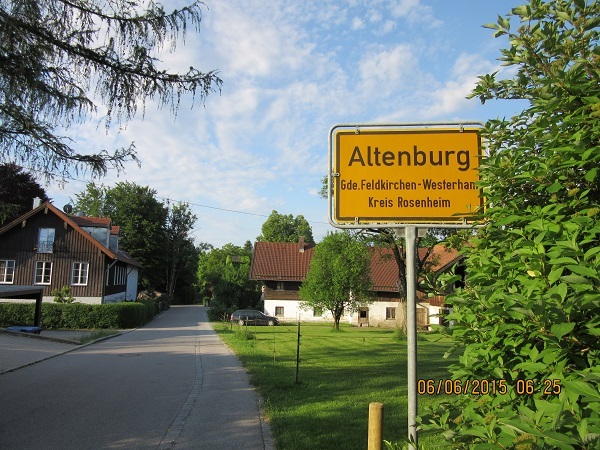 The Hamlet of Altenburg-Better Known As Home! Our journey in Germany began in May of 2014 when my husband arrived and immediately started working. I followed a month later after finishing up odds and ends back at our home in Washington State which included moving our Alpaca herd to the coast and beyond, renting out our house, making arrangements for all our pets and having some fine neighbors taking care of the trees in the Orchard. Determining where Dan would be working the most helped us decide where we would live, and Bavaria was it. We found a beautiful half- timbered house about 30 miles south of the marvelous city of Munich and about 30 miles from the Austrian border. We are out in the country, which we both love, on a narrow winding little road that does not have a name. We have a nice little yard for Gracie, our German Shepard and a deck that looks out over a pasture and in the distance, the Bavarian Alps which are just magnificent! 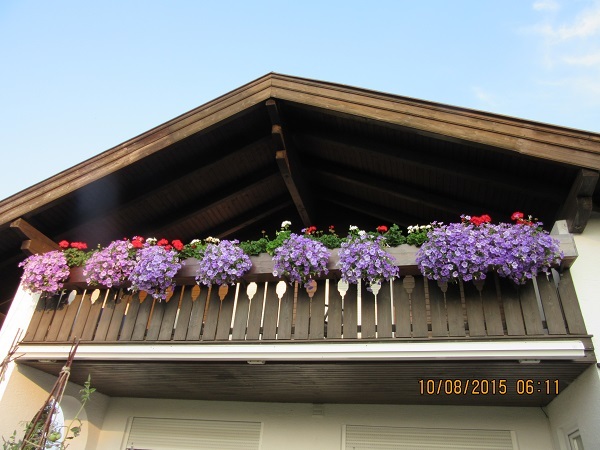 The house has a balcony off the second floor and we have the typical flower boxes overflowing with blooms that you see on almost every house in the Bavarian countryside. Our little no name road is about 1 ½ miles long and has 3 tiny Hamlets on it. Aschbach, Altenburg and Oberreit. We live in Altenburg along with maybe 50 other people. Did I say tiny? Each hamlet has a cluster of pretty half-timbered houses and each Hamlet runs right into the next. I f I walk down my driveway and turn right, I am in Aschbach. Left, and I walk through Altenburg which takes 2 minutes. Down the hill is Oberreit which consists of 2 working dairy farms, a lot of fields and a couple of pretty little ponds along with a Catholic Church which is open only for special services. Farmer Conrad has a herd of Fleckvieh dairy cows and a couple of intact bulls that he rotates through several pastures including the one that backs up to our deck. They are a very pretty cow. Light brown and white in color. Kind of mellow and they would come right up to the deck so we could give them water from the hose! They had a water tank on the hill but our hose was closer and they are really kind of lazy. I was a little nervous about the bulls at first especially when they came running up to the deck and the only barrier was one thin wire! But even the bulls were pretty laid back.The baby bull or “Hot Dog,”as Dan named him, would come up to the deck and BELLOW or MOO or whatever noise they make until we’d come out with the water hose! 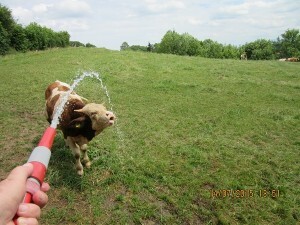 Hot Dog was one thirsty little bull. These cows have provided hours and hours of entertainment as we watch them chase each other, playfully butting one another and vying for chief cow status. I have got to tell you that never in my wildest imagination, did I think I’d be watering cows from a deck in Bavaria! 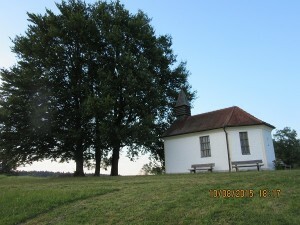 A short walk up the hill behind our house is the prettiest little Catholic Chapel. Beside it stands a huge shade tree and alongside are 3 wooden benches so walkers can sit and enjoy the spectacular,always changing, views of the Alps. It is quite a popular place for Sunday strollers to visit and have a rest. These chapels are unique to Bavaria and you find them everywhere from roadsides to private homes to the middle of the woods. Our chapel ( see how possessive I am already? I’m surprised I didn’t say it was MY chapel!) 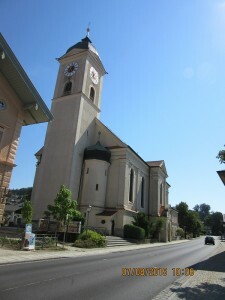 is used for weddings and this Spring I saw a group of young children and their teacher, all dressed in traditional Bavarian Dirndls and Lederhosen dancing around the front of the chapel while singing. It was so sweet to watch them! Two miles down a long hill from our house is the Town of Feldkirchen-Westerham, founded in the year 795 AD. Yes, that is correct,795 AD! Feldkirchen translates as “field of churches.” Wouldn’t I have loved to see how it looked way back then! Today, it is a bustling little town of about 10,000. The town has everything we need including grocery stores, automobile dealers, Gas Station, Post Office, Hair dresser, clothing shops and an Asian Restaurant! A very good Asian restaurant! Nothing makes me happier than a good Asian restaurant. We have beautiful St. Laurentius Church, an ice cream shop and a Pharmacy too. And this week the annual Volksfest or Folk festival, is in full swing with music, dancing, food and of course, Beer! Well, that’s my world right now. It’s a nice world and a lovely stop on my journey. Thanks for stopping by today. Come back soon!